The quarry and the paving-stone factory in Lahalla. In 2010 the company Rio Kulturkooperativ started developing an art- and cultural project with the purpose to visualise the remains and settings of the quarry industry (granite) in Bohuslän, and to emphasize its cultural heritage values. Kulturlandskapet (a company emanating from Rio Kulturkooperativ) has continued this task. The programme consists of three parts: Community builders, ”Kulturscen” and land use planning. The project Lahälla/Kulturscen was realised during the period February to December 2012. The project included, among other things, documentation and a damage survey of the paving-stone factory at Lahälla, interviews, and a report presenting the results. We have carried out interviews with both the current residents at Lahälla, as well as descendants of the former residents there, and we have spoken with a large number of people interested in and knowing the area. Extensive archival research have also been conducted. This has reinforced our view of the area possessing great cultural heritage values. Lahälla is a unique place because of the preserved paving-stone factory, at the same time as the area has many features in common with other quarrying villages. For a limited period, Lahälla and the northern parts of Bohuslän, underwent major structural changes because of the quarrying industry. People’s living conditions changed and improved radically by the developing industry. Also people’s thoughts and habits underwent a radical change during this time. The deep connection between worklife and the community as a whole, carries the embryo of our current society, where social movements have played a crucial role in the emergence of solidarity and democracy. The interviews gave us examples of how the families in the quarrying villages possessed both professional pride, joy in learning and a firm belief in a better future. Meanwhile, our informants testify about a hard life, and how short the road was between having a roof over the head and food on the table, to, if the accident occured, life ending up in misery. The companies owned the housing and the right to a home was linked to the work in the quarry. The quarry in Lahälla comprises several elements that defines it as a so called major quarry. The quarry is 30 meters high, there is six crane pedestals, and grout has been transported from the quarry on short railway-tracks. The grout piles are enormous even if material has been taken away the last decades. The factory, the cooling pond for the compressor, and the substation present large technological investments. We argue for the quarry and factory at Lahälla to be a protected heritage site, recorded as an ancient remain. Lahälla is representative even as an exponent for the heavy impact the quarrying industry had on the community and the environment during the hundred years between 1860-1960. 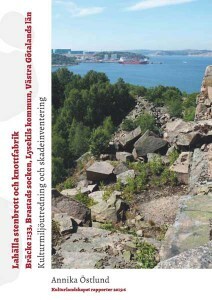 A comprehensive study of the remains from the quarrying industry in northern Bohuslän is urgent, but the knowledge is after all so good about Lahälla that it should be possible to record it as an ancient remain. We firmly believe that the quarrying area at Lahälla, including the grout, should be protected from all non-reversible exploitation and development, so it could be preserved to the future. We also feel that the factory and the substation should be restored in the way proposed in the report, and that these buildings should be designated as important cultural heritage buildings. In September 2012, a public display was held in Lahälla, comprising storytelling as well as illumination of the quarry and the factory. Cutting of paving-stone were shown by the stonecutter Martinho Escudeiro. The whole arrangement were filmed by Malin Franzén. You can watch the film with english translation here. Kulturlandskapet talked about the project and showed the film at the CHAT conference in Sheffield, England (30 October – 1 November 2015). 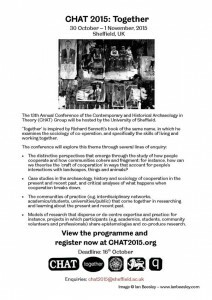 See a poster for the conference here. You can download a report on the documentation of the quarry here. The report are in Swedish but has a summary in English.